Develop a list of Strategies that broadly govern how to run the business, the types of projects to emphasize and the measures of acceptable performance. How much capex should we commit in any one country or play type? How will the price of oil and gas change in the future? Should we enter into a country? What portion of our personnel can we move between projects from one year to the next? Should we exit a country or play? Do we want to maximize growth of NPV or do we need to emphasize near term production and/or earnings? We do not need to set the levels of performance, but we need to know which measures of performance will be important. With Strategies and the Database of Opportunities, build real, executable investment portfolios (exploration programs in this case) and store the portfolios into the BlitzPort Database. BlitzPort Builder is one tool you can use to build these portfolios. Builder can hold an investment inventory of over 5000 opportunities. It can create one year “Tactical Plan” type of portfolios at the rate of 10 portfolios per second with a variety of capex and performance levels. Builder can also create multiple year Strategic Plan portfolios at the rate of about 3 seconds per portfolio. Each portfolio uses the actual working interests of opportunities available at a given strategy. 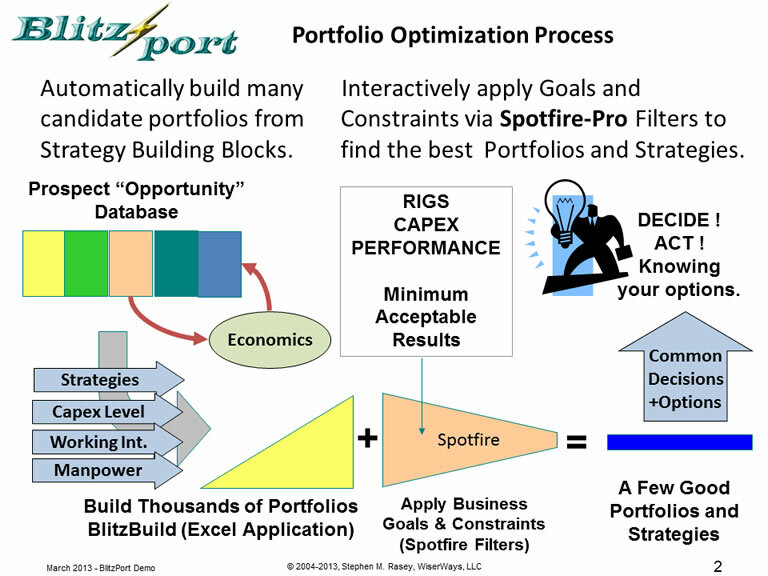 Once you have hundreds to hundreds of thousands of portfolios in the database you can load tens of thousands of portfolios into Spotfire Decision Site and view them in BlitzPort portfolio templates. Spotfire is a superb tool for visualizing and sifting large amounts of data. Blitzport loads portfolio data into Spotfire where each row of a table is one portfolio and each column is a measure of those portfolios. A Spotfire chart uses columns from the data table as the measures for X, Y, Z axis, color, size, shape, orientation, label and connections. Each Point or Line on a chart is a single portfolio - a row of the table. All charts in Spotfire are linked to the same data table. Selecting a set of data in one plot selects the corresponding points or lines in all other plots. Spotfire’s power extends far beyond making charts. Spotfire creates for each column in the data table a “Query Device”, an interactive control where you can control which rows of the data table are visible based upon values in that table’s data column. In BlitzPort, all portfolio measures appear as Spotfire Query Devices. Here, using Spotfire, managers can apply and change limits to Capex, minimum performance levels, and investigate differences in strategies by changing the Query Devices associated with each portfolio measure. Managers change portfolio goals and resource limits by changing Query Devices and can immediately see portfolios remain visible in the Spotfire charts. In doing so, managers see the trade-offs between conflicting measures and can choose where to set the goals. In minutes, portfolio management teams interactively whittle away 20,000 possible portfolios by applying tighter requirements and goals. Eventually, they will be left with a few good portfolios that all satisfy the Portfolio Team's requirements. The BlitzPort Census tool creates a report that lists the opportunities funded in the surviving portfolios. Census reads from Spotfire which portfolios are “Marked”, then fetches from the database the investment opportunities funded in those portfolios. Census then sorts those opportunities according to decreasing number of times the opportunities are funded in the selected portfolios. With the knowledge of which Opportunities are funded in: (a) all selected portfolios, (b)in most portfolios, (c) in some portfolios, and (d) in none of the portfolios, managers can be confident in their decisions about how to invest in the business’s future.